There is an undiluted pleasure in attending literary festivals, large or small, that never dims. It is the excitement of the accidental encounter, brief glimpses of a worshipped author in the book tent, or the slenderest acknowledgement over a book signing, that keeps alive an air of fevered anticipation. It is an added bonus that many are held in the most wondrous historic settings, peppered with centuries old stories of their own. So, in advance of Saturday’s visit to Althorpe’s Literary Festival, I was as eager as a child on Christmas Eve. Although, on this occasion, given a certain constraint of time, the purpose of my visit was a focus on one man, and one talk. The cause of my excitement? 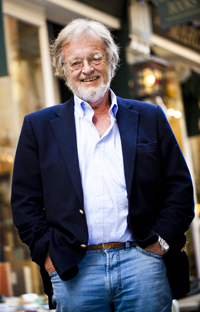 Bernard Cornwell discussing his only work of non-fiction, Waterloo. 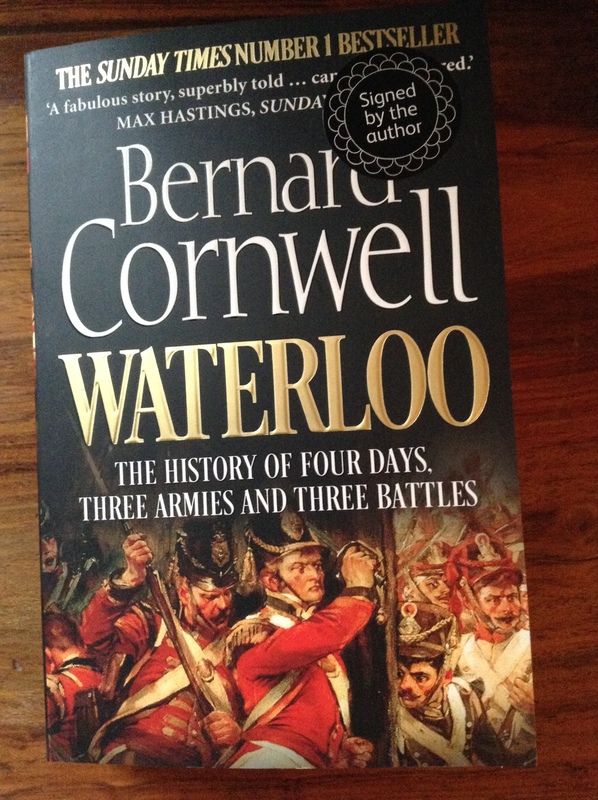 My admiration for Bernard Cornwell is fairly recent, despite my years of devotion to the tv adaptations of Cornwell’s Sharpe books, played to perfection by the brilliant Sean Bean. For some reason, I had never read the books. I do not know what set me on the path to righteousness, but I read my first Sharpe book maybe two Summers ago, and I have been hooked ever since. I began to obsess over reading each Sharpe book in the correct chronological sequence, battle by battle, so that books I had already acquired had to lie in wait till the right moment. My reading for a while comprised only Bernard Cornwell. 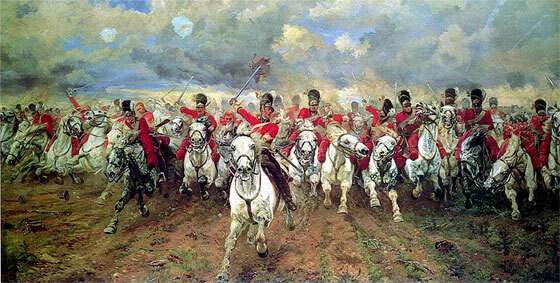 I could quite happily and without effort fill a whole family conversation with Sharpe’s exploits at Assaye, or Copenhagen, or mulling the terrible plight he faced at Seringapatam. I have since detoured out, with new authors introduced and old ones revisited, but the remaining few Sharpe books I haven’t read are there and waiting, for times needed, and a July holiday in France. Cornwell did not disappoint, and nor did Althorpe Park, much that the fairly constant rain on Saturday created a slightly gloomy canvas. I met with some wonderful and delightfully engaging people, and had long conversations over coffee and a meandering walk to the lake to view the island where the late Diana, Princess of Wales, is laid to rest. Cornwell did not disappoint is a huge understatement. He was brilliant! At one time funny, articulate, clever, responsive to his audience and their various desires and to his host (whose name I never did catch). He is a show-man, seemingly as much at home before an audience as he is researching his next work of fiction, or delving with meticulous detail, into the lives and stories of those men who lived and died at the battle of Waterloo. His command of his subject matter is extraordinary. I had a moment of self-congratulatory pleasure at recognizing place names and key characters as they featured in Cornwell’s talk. Years of interest in military history has served me well. A gentleman to my right extolled the delights of Cornwell’s Warlord Trilogy, and so enthused me that my next reading, beyond Sharpe, is assured. Rather pleasingly, he was as knowledgeable about Sharpe as a person could wish. I was enchanted from beginning to end. I adored the impromptu casual exchange between Cornwell on the platform and Andrew Roberts, author of, amongst other literary works, Napoleon the Great, in the audience. Their exchange was beautifully timed and rather delightful. At Cheltenham Literary Festival, I was enthralled by Roberts as he talked of Napoleon in the faded grandeur of Cheltenham’s Town Hall (still a most beautiful building). 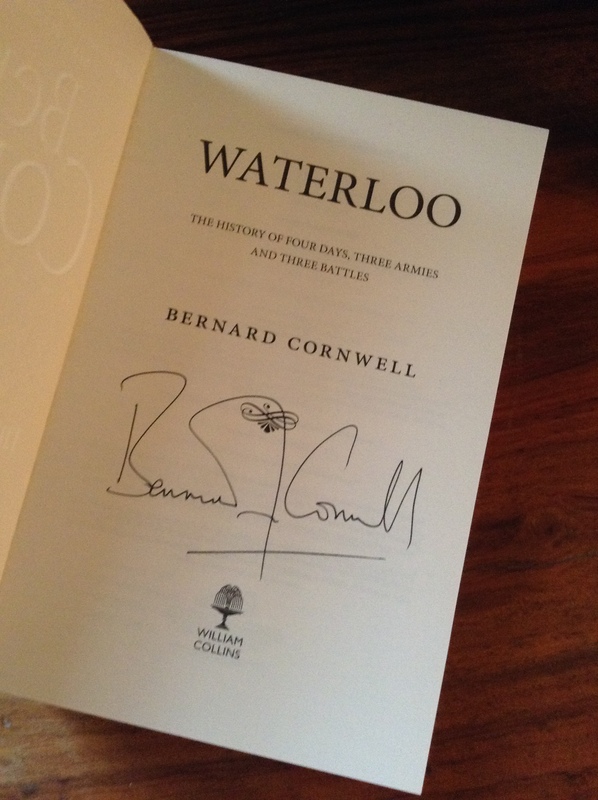 I was thrilled also, later in the morning, to find a few remaining signed copies of Waterloo in the book marquee, something I feared I had missed, as the book-signing tent was full to bursting immediately after the talk and Cornwell was leaving the event early. Such days are times to treasure. Literary festivals give life to a place, to books and people yet to be discovered, or long-loved and familiar. They are extraordinarily rewarding events, in the conversations that emerge as people share their passions and in the connections that are forged. There is something rather special about hearing a long-admired author talk so passionately and eloquently about their creative works. So, dear reader, what literary festivals do you indulge? What authors inspire you to absolute devotion and what moments do you savour of these wondrous events? Wishing you a glorious festival filled Summer.